This year’s Costume Institute exhibit, Schiaparelli and Prada: Impossible Conversations, opens to the public today at The Metropolitan Museum of Art. The premise of the show is a dialogue, in words and clothes, between two iconic Italian women designers—Elsa Schiaparelli and Miucci Prada—divided by decades but sharing a similar off-beat and provocative aesthetic examined through three ideas of chic: Hard Chic, Ugly Chic, and Naïf Chic. Judy Davis plays Elsa Schiaparelli in her dialogue with Miuccia Prada. In his remarks to the press on Monday, Harold Koda, Curator in Charge of The Costume Institute, noted that the Met was the recipient of a large number of works by Elsa Schiaparelli given to them in 2009 by the Brooklyn Museum—many of which were on display in Brooklyn during the gorgeous show American High Style: Fashioning a National Collection in 2010—and it was this gift, coupled with the idea by Mr. Koda and curator Andrew Bolton to showcase two women designers together, which made the timing seem right for an exhibit of this kind. Prada talks with Schiaparelli about how she found her way into fashion. But how do you do this when one of the designers in question died in 1973? You bring Judy Davis on board to play Elsa Schiaparelli (inspired casting, I have to say) and hire Baz Luhrmann, director of Moulin Rouge! and this year’s highly anticipated remake of The Great Gatsby, to help stage the whole thing. The two women, Davis and Prada, never even met. 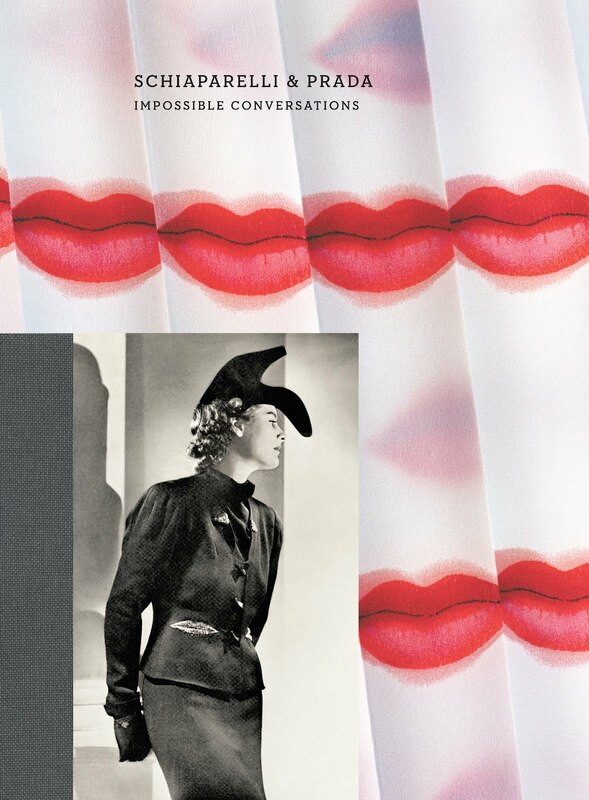 Miuccia Prada was interviewed by Andrew Bolton and Schiaparelli’s part of the dialogue, taken from her 1954 autobiography Shocking Life, was acted by Ms. Davis at a completely different time and place. Put together, you can’t imagine that Schiaparelli and Prada aren’t in the same room. The conversation, set at an elaborate table and inspired by the film My Dinner with Andre kicks off the exhibit and then reappears throughout it, Schiaparelli and Prada’s faces and conversation instantly popping to life behind the clothes. If you’d like to see the videos for yourself click here. Schiaparelli and Prada toast each other at the end of their discussion. In galleries that examine how each designer expresses the Classical Body, the Exotic Body, and the Surreal Body, not only do the imaginations of Schiaparelli and Prada seem endless, as do their use of unexpected materials, patterns and shapes, but both designers push viewers of their work to question accepted ideals of youth, beauty and femininity. Prada skirt autumn/winter 2004-5, Schiaparelli evening jacket, summer 1937. A Schiaparelli ivory silk velvet dress, 1936. Gorgeous! Prada leather dresses from 2009-10 mingle with Schiaparelli black dresses from the 1930s. White matelassé silk printed in wood grain pattern with leaf-shaped button. Bill Cunningham is on the left. He walked into my shot! Prada dress, 2007-8, brown and orange ombré wool, orange plastic fringe, and feathers. Wallis days before she married Edward in 1937 in Schiaparelli's famous "Lobster" dress. Bill Cunningham walked into your shot!! How much fun is that! I love this post and so wish I could see it! Thanks for sharing! You inspired one of my accessories in today's post...and I linked your site! Thanks for the inspiration, Jill! How cool is it that Cunningham wandered through your photo! I love the blue velvet jacket...and I think I need to read Schiap's book. That would be a fantastic show to see. Ahhh, to be in NYC. Thank you so much for giving us who are so far away a glimpse into the rooms! Beautiful show & loved you with Anna in the Daily Mail...too much fun!! !